I’ve been lucky enough to see some of the world’s greatest art, and I have crawled around some of the most ancient ruins that humans have located. At some point I always say, “I don’t need to see any more.” But I never get tired of looking at mountains! 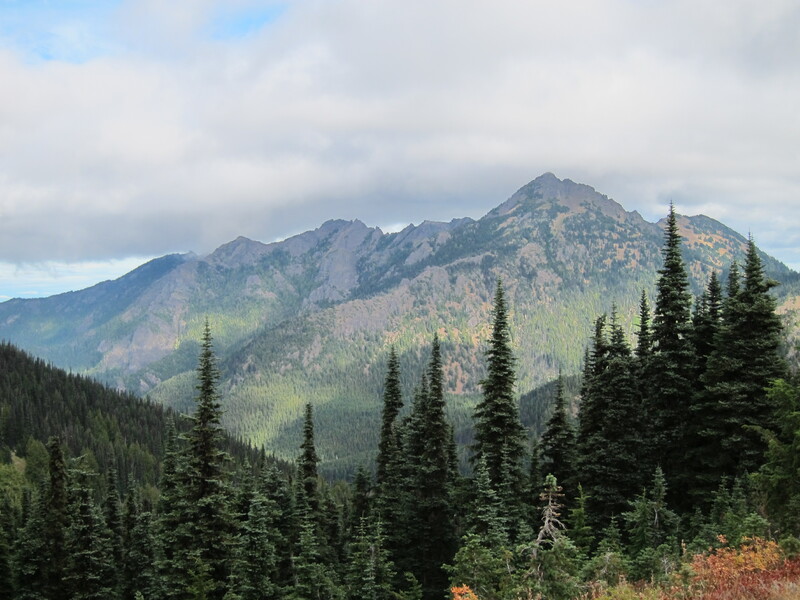 In the summertime, eager tourists visit the Olympic Peninsula to enjoy her many and varied terrains. From the Hoh Rainforest of the west to sunny Sequim, there’s plenty to see and do. Festivals abound in the summer, and campgrounds fill. When the tourists go home, though, locals take advantage of hiking opportunities. A nip in the air makes for perfect hiking weather. Though the best of the wildflowers have gone for the year, the leaves are starting to change color. If you’re lucky, you can catch a glimpse of marmots playing, enjoying sunshine, or just waddling around before they start to hibernate later this month. We moved here in part because of our love for hiking, but other activities have kept us busy. Then, at a recent auction to raise money for the Jefferson Land Trust, which helps preserve farmland and wilderness in the area, we signed up for a guided hike that took us to the Elwha River, the site of the largest river restoration project in the world. 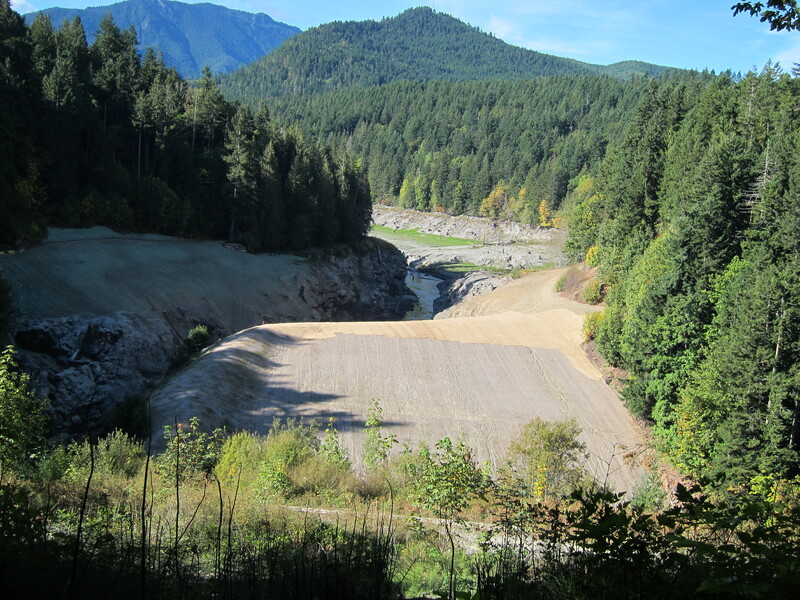 The Elwha Dam has been removed, and removal of the Glines Canyon Dam is forthcoming. Restoration is a slow, careful process so that the salmon can return safely. Later, we hiked at Hurricane Ridge. Hubby and I tried to hike it in June, but the summit was still covered in snow. On this day, however, we had glorious views, as you’ll see below. This area is just about 1.5 hours from where we live. To think, we used to get on airplanes to go see this scenery, and now we don’t have to! 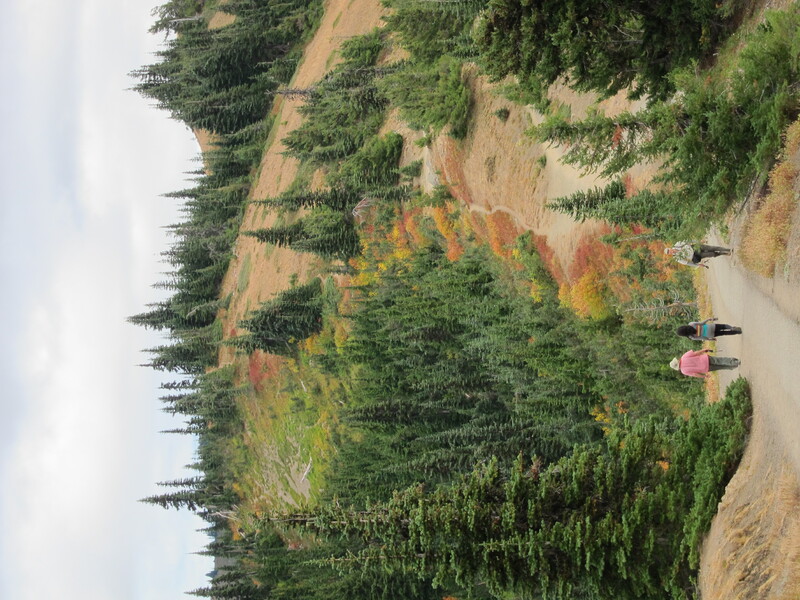 Have a hiking spot you want to share? I’d love to hear it! When we lived in Houston, we never saw fall color, so we’re giddy as we watch the leaves start to turn. Here’s the site of the former Elwha River Dam. Protective matting has been laid and native plants are being installed to prevent invasive species from rushing in. 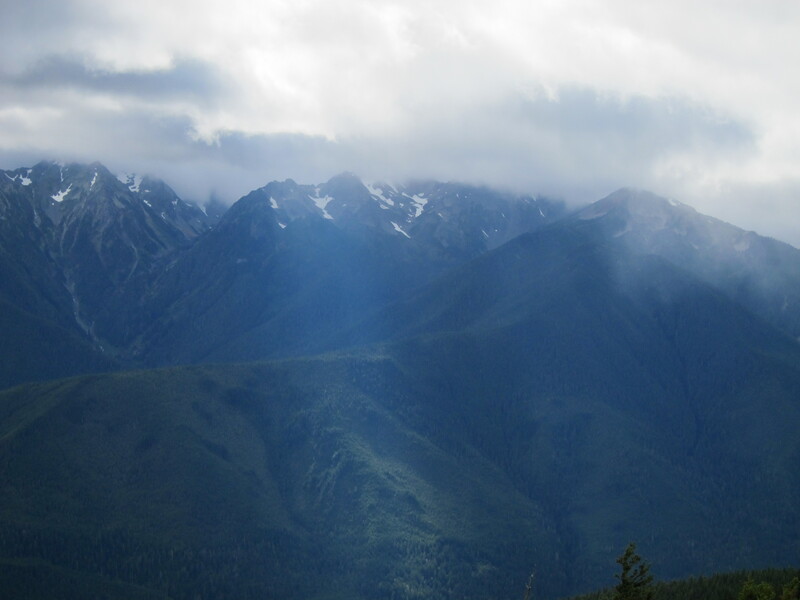 The Olympic Mountains capture the rain, creating a “rain shadow” effect that keeps us much drier than other parts of Washington State. How wonderful to live so close to these awesome places! Thank you for sharing these photos. We live near the Blue Ridge Mountains, and we like visiting, though we haven’t done a lot of hiking lately. You’ve inspired me, though! Interesting that you mention the Blue Ridge Mountains. Hubby works for a company in North Carolina, and they always have him visit in December. Just this morning he was begging for them to move his visits to spring or fall so we can spend a few days exploring trails off of the Blue Ridge Parkway — which is always closed in the winter. We’ll get there one day! I’m not sure I can pick a favorite hike. Every one is unique. One of my most memorable was the Black Forest in Germany. The forest was so thick that I began to understand why fairy tales like Hansel and Gretel were created — they had to do something to keep kids from wandering into the thick, dark woods. I’d still love to hike an alpine meadow in bloom in Switzerland or Austria (a la Sound of Music). But still I love hiking our mountain-less Midwest trails in all seasons. It’s enough to be out amid nature and moving my body. Makes me want to visit Germany! We haven’t made it there yet. I agree, hiking is fun regardless of where you are. It’s great to get outdoors!